Strangers and friends often ask about our favorite destinations from our experiences traveling around the world. It’s a question that is always difficult, and we won’t ever have an answer, but there are countries and places that stand out. Mozambique is a standout. 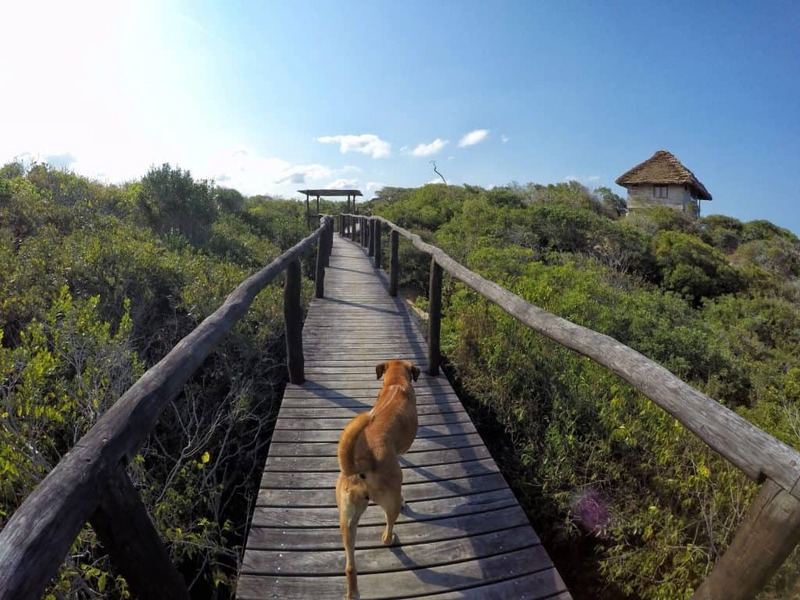 Our holiday in Mozambique was made even more special with our stay at Travessia Beach Lodge. 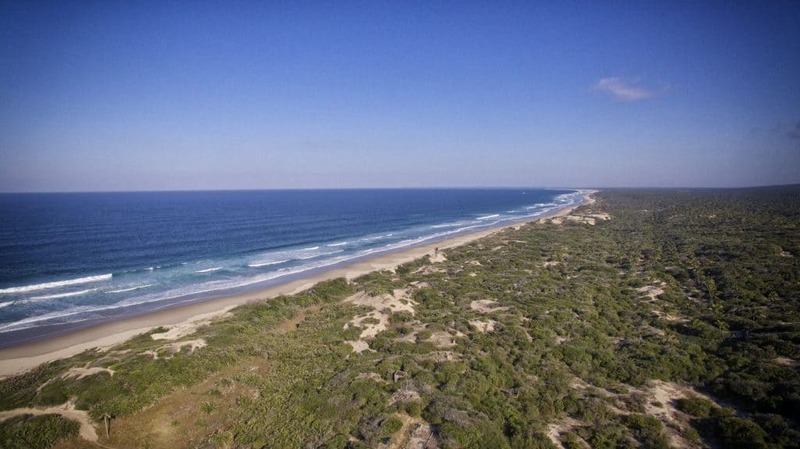 Most journeys through Mozambique will involve traveling along the N1 – the only highway and paved road for much of the country that extends up along the coast. A turn off of the familiar highway in Mozambique leads into rows and rows of palm trees and deep sand roads. It’s the sort of thing that would turn away those who are looking for a packaged vacation in Mauritius or Mexico. 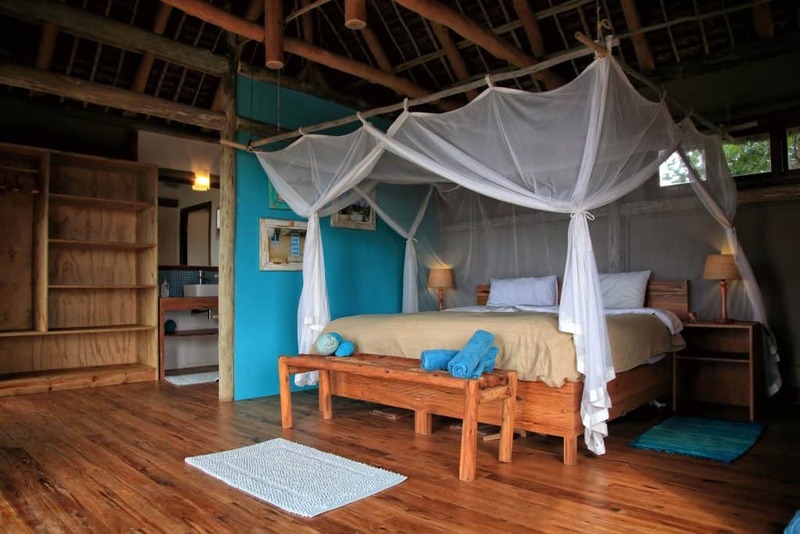 However, it adds to the exoticism, romance, and beauty of the destination, Travessia Beach Lodge. It was late in the day by the time we had arrived after snaking through the sandy roads to the main lodge. 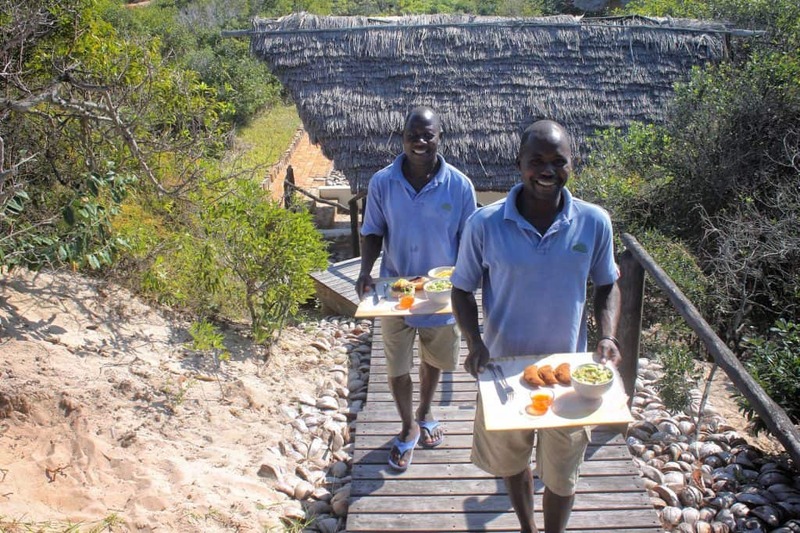 We were greeted by the amazing staff here who brave the Mozambican bush to maintain the remote beach destination. The lodge itself was brought to fruition by some passionate expats who appreciate what an incredible spot in the world it is. 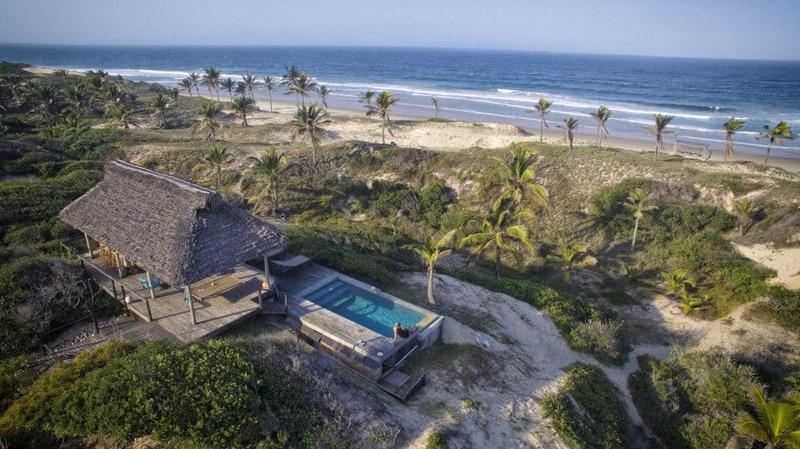 After several years of paperwork and construction, Travessia became the perfect destination for a holiday in Mozambique. For us, it was five days with no shoes, coconut waters, and relaxation. If this is where tourism is headed then we are fans. 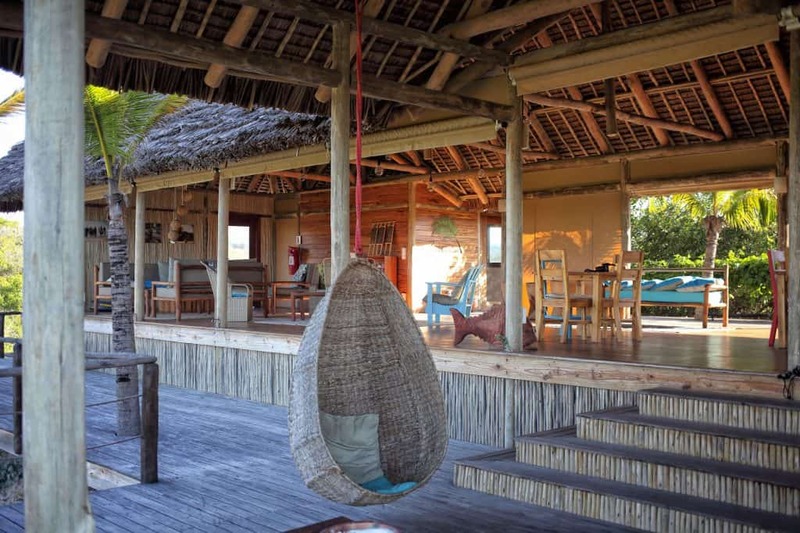 Travessia Beach Lodge was built right into the sand dunes with the goal of being very low impact. No bulldozing over the former landscape to build some big concrete structure to pack tourists in like sardines. Here it is the guest, birds, sea breeze, and ocean vibes. 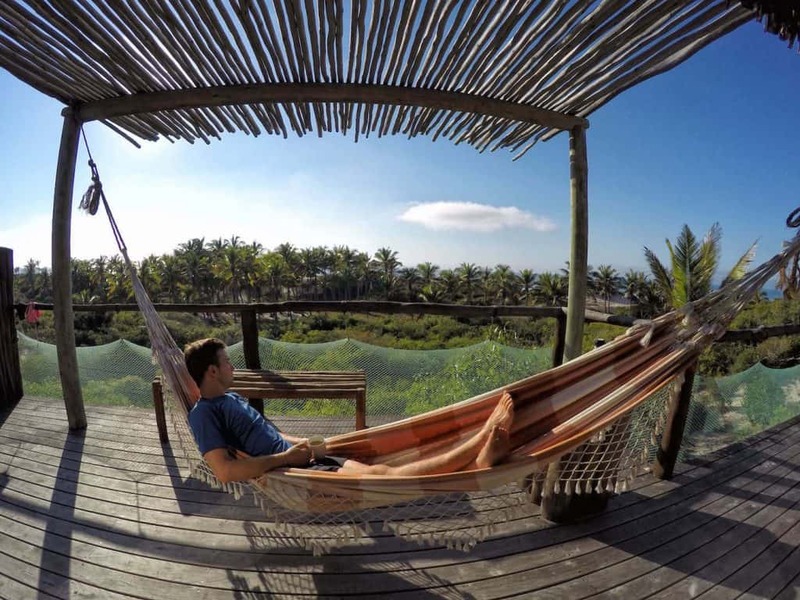 The main lodge is open to its environment with a thatched ceiling, colorful furniture, and a view out to the ocean. Featuring a restaurant, pool, bar, some super awesome chairs to kick back in, and the best setting you could ask for it’s the sort of place you need spend some time with. Our “room” was a “casa” or tent on a platform surrounded by flowers and trees. Great views awaited us each morning while we drank our ever so important first cup of coffee. Waking up with fresh coffee and a hammock to laze about in is certainly a way to live. We spent a lot of time relaxing in our room and reading while listening to the tropical birds and crashing ocean waves – tranquility. The best feature of our room? The view from our outdoor shower was a crowning feature. At night in Mozambique, the milky way splashed across the sky and the stars became innumerable. Stargazing under piping hot water is new pass-time for us in Africa. Maybe it’s something in the delicious seafood, but the staff at Travessia Beach Lodge are all smiles. It’s that Mozambican flair, friendly as can be. You’ll come to learn their names quickly and there is never a dull moment with them. 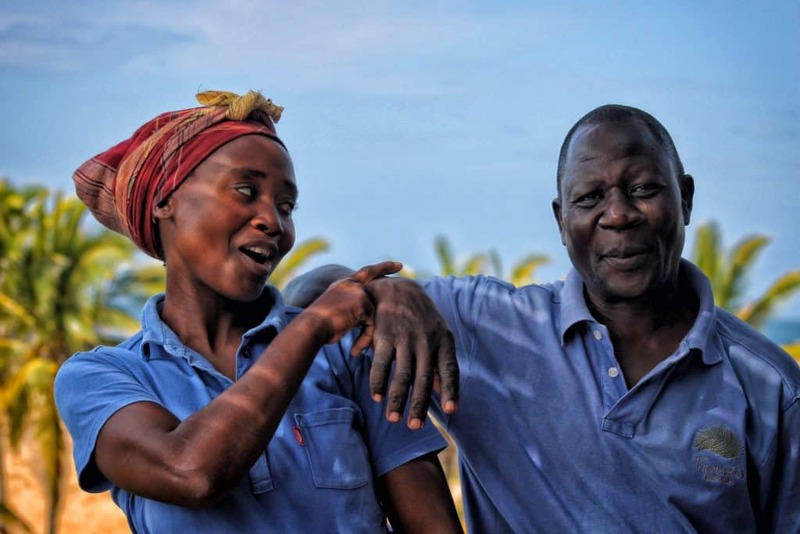 Whether it was dropping off morning coffee, climbing the palm trees for fresh coconuts, or showcasing our dinner we were always met with a smile and a willingness to engage with us. In normal environments, we often rave about the city or how much there is to do. 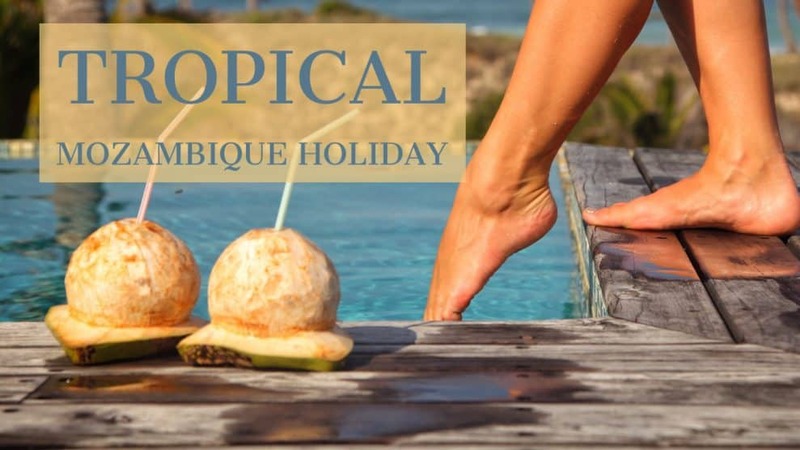 With a holiday in Mozambique, it is about complete relaxation. It is about enjoying the beauty of nature and the serene coast. Travessia has worked to engage and support the community that surrounds it. 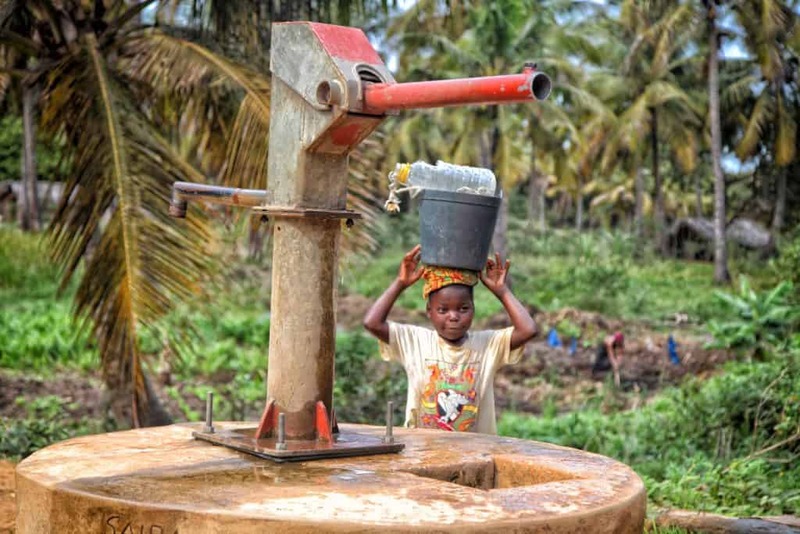 Providing the villages with wells, schools, and even supplies such as solar panels. 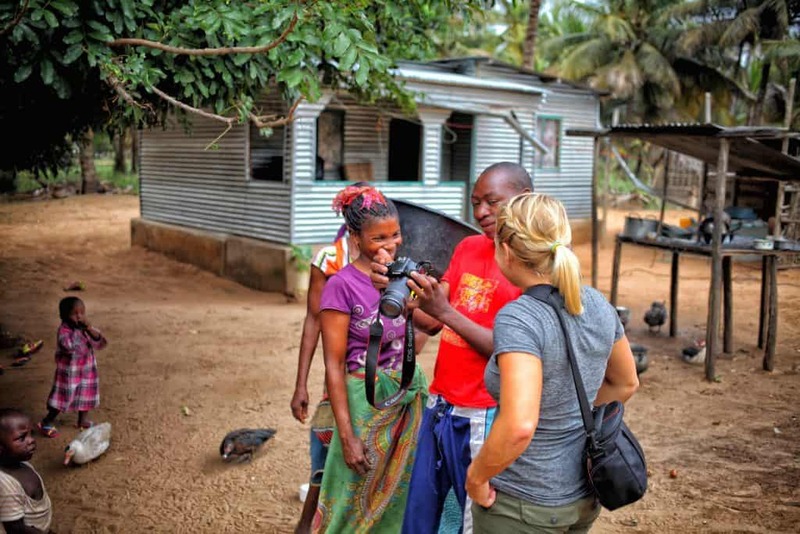 A unique selling point Travessia offers is a walk through the local villages allowing visitors to get a true look at what life is like in rural Mozambique. 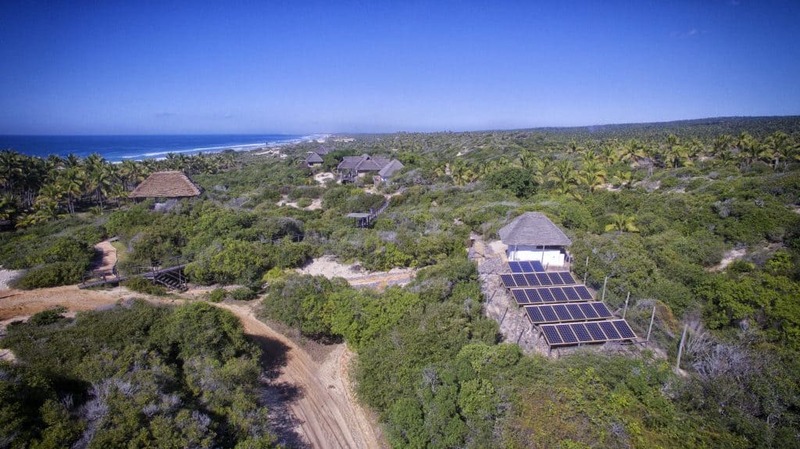 Lodge owners in this country are often passionate about the environment. To build a lodge in a difficult location requires the passion for the beauty that it holds and will sustain. Add to the fact that there was no grid nearby, Travessia had no option, but to be self-sufficient. Power is run almost entirely on solar power asides from the few cloudy days that the area brings. The details have clearly been thought out and hot water comes piping out of the shower from an indirect fired hot water heater. 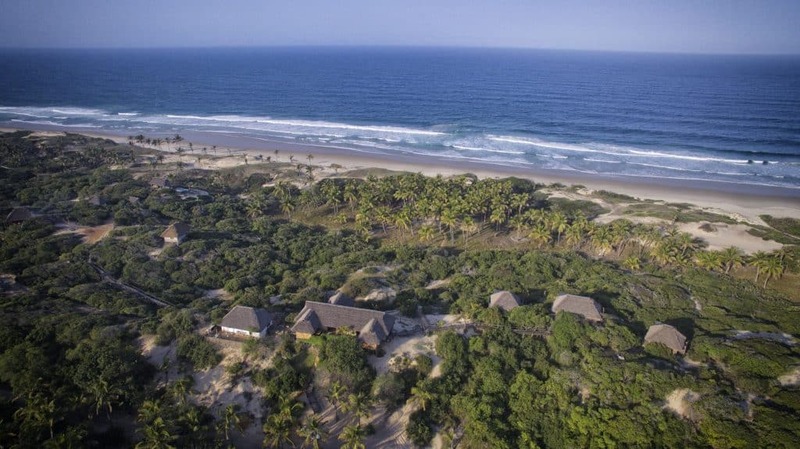 Add to the fact that during construction little to no harm was done to the small piece of Mozambican coastline. With fresh seafood and a tropical climate, it shouldn’t be too much of a surprise you can find some awesome food in Mozambique. The famous spicy peri peri is present in many of the dishes and the interesting looking matapa is sure to entertain. 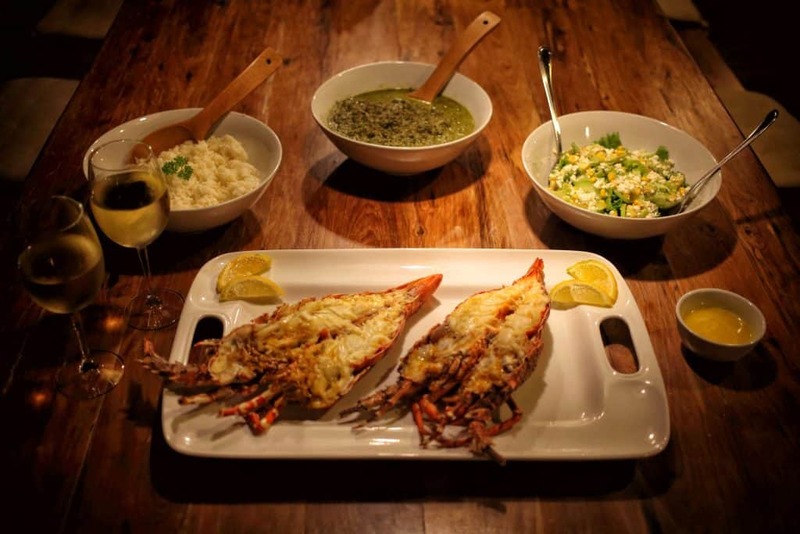 The lodge tries to incorporate a local is a lekker night for every guest and features specialties from the region. Our last night was a tasty spread with lobsters from the sea and traditional matapa (coconuts, cassava leaves, and seafood). Matapa may look like baby food, but it truly delicious and a specialty in Mozambican cuisine. Try it! LOCAL IS LEKKER! We could eat like this every night. Those that are looking for a “working” vacation should be aware that Mozambique may not be the place. There’s little to no signal in camp and no WiFi available. Here you can turn off the electronics and take in the beauty of the surroundings. Instead of checking morning updates and email, it’s checking if the palm trees are blowing . If you are a travel blogger (hint,hint) and must connect we found that you can catch a slight signal with a Vodacom sim card and a phone situated ever so perfectly in the right location. If you had referred to sundowners before we’d traveled to Africa we would have looked at you sideways. However, now it is something we’ve come to appreciate and love. The view from the bar at Travessia is one that is to be admired with a cold beer or fresh coconut water in hand. The bar and pool sit on top of a dune that looks directly over the beach and offers some of the best views from the lodge making for great sunsets over the palms. The thick air in Mozambique burst into flames when the sun dipped below the horizon making for a spectacle that. The beach here had to be the selling point. Mozambique had stunning beaches up the entire coastline. Spending time soaking up the sun, swimming, surfing, or riding one of Travessia’s beach bikes down the coast were all great ways to enjoy the setting. The beach seemed to stretch on forever. One afternoon we went for a ride along the coast and found no end in sight. 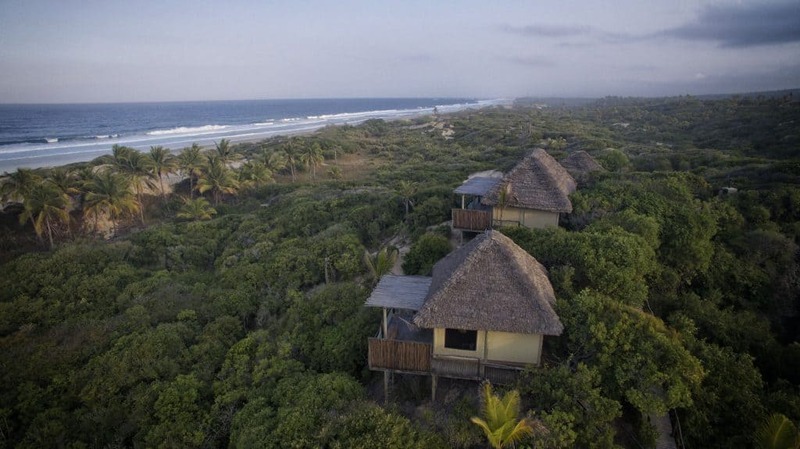 It is the largest draw to spending a holiday in Mozambique after all. The country itself was a highlight for our journey around the world. It is a place that is hard to find elsewhere in the world. 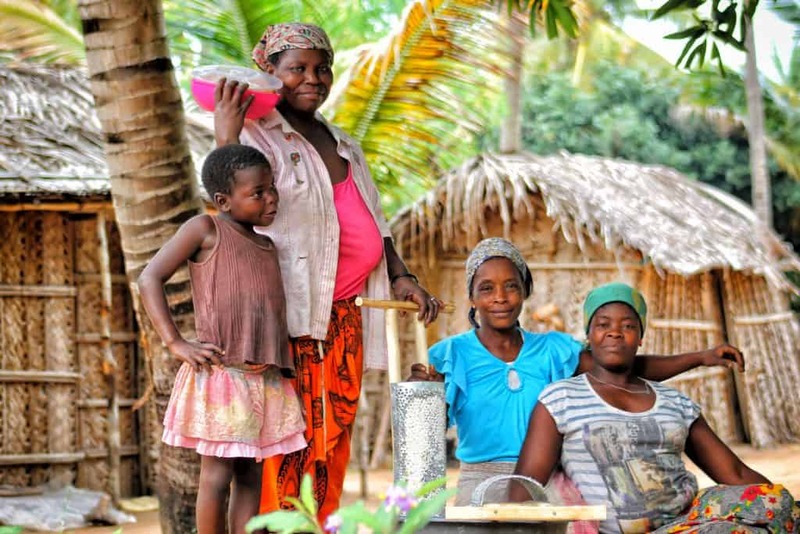 In Mozambique, people will greet visitors with a smile. For us traveling full time, destinations can begin to feel like work, it takes a special place like Travessia to make us feel as if we’re on holiday. It’s an escape for even us and because of that, it felt like a holiday and an astonishing place. We left Mozambique and Travessia knowing one thing for certain. We will have to return. Make sure to stay up to date with Travessia and ask them about their rates here! Thank you to Travessia Beach Lodge for hosting us. As always all opinions are our own.